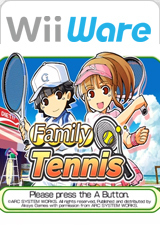 In Family Tennis, Daddy, Mommy, Sarah and Billy return for some hard-hitting, fast-paced tennis action. Battle it out between the happy family members as you vie for the top spot. Choose from three different modes: Elimination Match, Free Match and Thrilling Rally. Play against the CPU or compete with friends. Elimination Match mode pits you against the CPU to test your skills, while Free Match mode allows you to play against another player under conditions of your choosing. Thrilling Rally mode lets you join up to three other players and rally to see who can get to 100 points first. The graph below charts the compatibility with Family Tennis since Dolphin's 2.0 release, listing revisions only where a compatibility change occurred. This page was last edited on 12 January 2017, at 13:37.